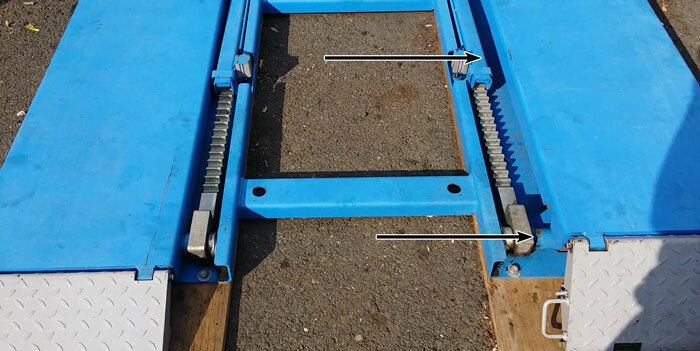 In order for the 7K Kwik Bay to suspend a vehicle in the air LONG TERM (longer than an 8 hour work day) the weight must be supported by the locks. 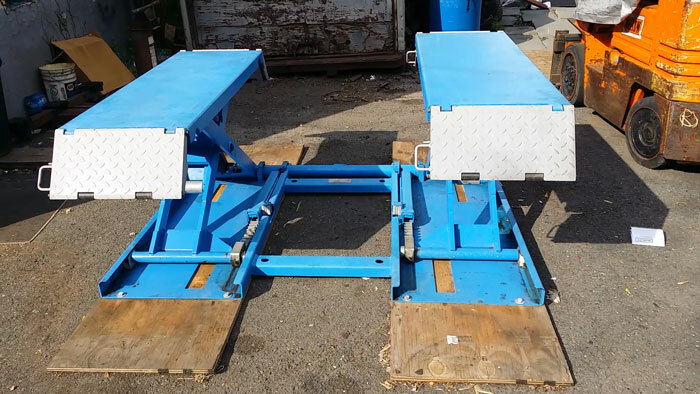 The 7K Kwik Bay is designed to be a Quick Service Lift. The Emergency Safety Locks are not used to support the vehicle's weight during regular, SHORT TERM, service jobs. The locks are an Emergency Safety System to prevent the lift from falling in the event of a Hydraulic Failure. In order for the 7K Kwik Bay to be used as a LONG TERM vehicle support it is the responsibility of the Customer to assure that the locks engage and disengage at the same time/Lock Position. The goal is to raise, support and lower the vehicle weight evenly, side to side and back to front. 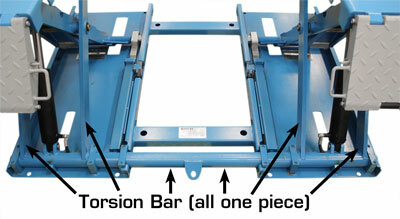 The 7K Kwik Bay is kept level by a long torsion bar. This bar carries the outer scissors for both runways. This assures that the runways will stay level with each other unless; the lift is loaded incorrectly; the operator fails to verify that the lock bars have fully disengaged; or a hydraulic leak is present. Please see below for an example showing what can happen if the lift is used incorrectly and the proper guidelines are not followed. 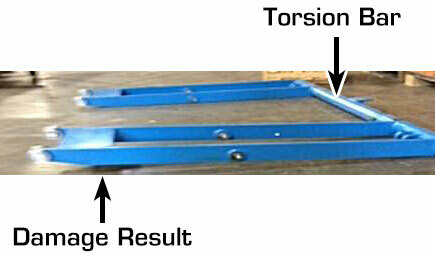 This pictures shows a lift that is not level due to poor weight placement. This caused a bind in the Passenger Side lock mechanism. The result is the Driver Side lowered and the Passenger Side stayed up. This caused the Torsion Bar to distort. You can see that even with the lift in the fully lowered position, the Passenger Side runway is still a few inches higher than the driver side runway. This can only be caused by twisting the Torsion Bar. Again, this component is all one piece.